« Funniest Teacher Gift Ever! A photo of a US primary school teacher walking his students home has gone viral, with universal praise for the young man going over and above the call of duty to ensure his students’ safety. 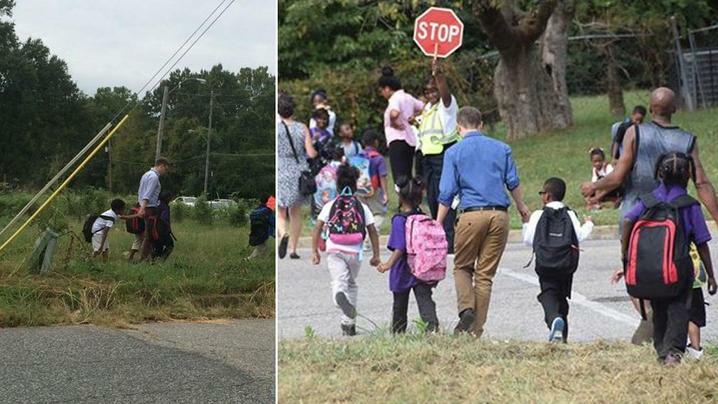 On September 28, Memphis woman Tabitha Tudy Jones shared a photo on Facebook of teacher Carl Schneider walking students home from Whitney Achievement Elementary School. “Coming from the Post Office on Whitney & Baskin I saw this teacher walking his students home… (more students lagging behind) Wooooow! Big UPS to this teacher! Just found out his name is Mr Schneider!” she wrote. “I didn’t think this was part of the job description,” Ms Jones added in the comments section. Click on the link to read And You Want to Remove This Teacher? This entry was posted on October 8, 2015 at 10:16 pm and is filed under Inspirational Teachers. You can follow any responses to this entry through the RSS 2.0 feed. You can leave a response, or trackback from your own site.